Husker du min blog om min søsters flytning til Colorado? De ankom sikkert der sidste uge og jeg ønskede at dele billeder af min niece i hendes nye by! Do you remember the blog about my sister´s move to Colorado? They arrived there safely last week and I wanted to share the pics I have of my new in her new town! Campbell og deres hund, Lola, på terrassen ...kan du se SNEEN??! 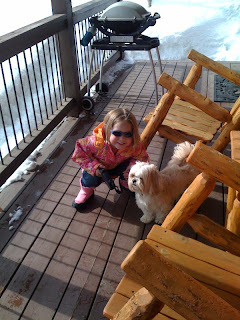 Campbell and their dog, Lola, on the patio...can you see all that SNOW??! Campbell er klar for hendes første bustur. De bor i Crested Butte, en "ski-by" og byen har en "shuttle" bus at køre frem og tilbage imellem deres kvarter, byen og de "ski lifts". Kan du gætte hvor vores familie planlægger at holde jul dette år??!! Campbell is ready for her first bus ride. 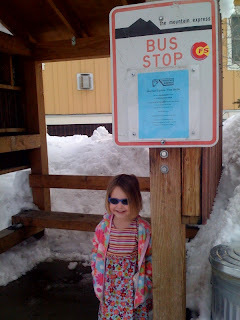 They live in Crested Butte, a ski-village and the town has a shutle bus that runs back and forth between their neighborhood, the town and the ski lifts. Can you guess where our family plans to have Christmas this year??!! Campebell is so cute! This seems like the perfect place to spend Christmas! Wow - just perfect! Love the new home. I've heard that Colorado is stunning.